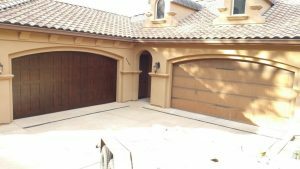 A customer of ours called us wanting to install custom carriage house garage doors for their home. 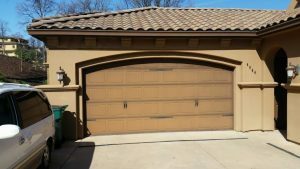 They were in the process of a complete home renovation and that included updates to their home’s exterior and their garage doors. They love the carriage house style look, so that is what we zeroed in on when looking for the right doors to match their remodel. Their existing doors weren’t so bad, just a bit weathered and needing a paint job. Instead of just adding some carriage house hardware to give the look of the carriage style, we decided to go with brand new doors. Below you can see their old doors. The new doors they ended up choosing are wood and steel backed, for durability and insulation. Carriage house style doors always look great, but they are great quality as well and will las for years! In the picture below, we had installed only one of the two doors. It’s a great side by side to see how weathered the existing doors were. Despite the weathered look of the old doors, you can see how the deep rich wood tone in the new door really compliments the existing paint color of the home’s exterior. The contrast is perfect! The great thing about the carriage house style is there are many sub styles to go with when choosing hardware. You can get a specific look you want, and a unique one based on your choices. 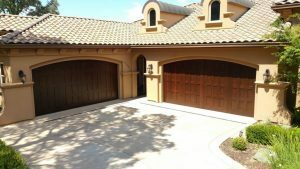 For this project, our customer chose some iron handles and rivets to accent their beautiful new garage doors. There are many great names for the hardware styles available to customize carriage house doors, including Tuscan, Barcelona, Park City, Virginia, Carolina, Santiago, and Cambridge. You can see the styles here. Below is a great shot of both doors installed. Such a difference to the home’s curb appeal and best of all, our customers are happy!